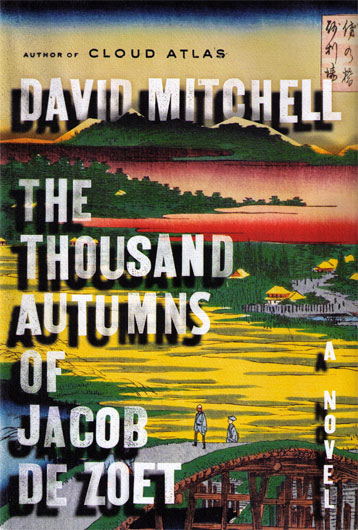 David Mitchell gave a reading in July 2010 at the Free Library of Philadelphia soon after finishing the Thousand Autumns (and evidently before it hit the shelves), and at that reading, an audience member asked Mitchell about his writing process. Mitchell said when he’s starting, it’s impossible to start with a blank screen, though a blank sheet of paper presents a few ways of getting in. I also find it nearly impossible to know where to begin, though mostly because this is a difficult one to review. This is, to my knowledge, David Mitchell’s first historical fiction. The Thousand Autumns of Jacob de Zoet (pronounced “zoot”) is based in Dejima, which was an artificial, fan-shaped island built in the bay of Nagasaki, mostly as a point of trade. 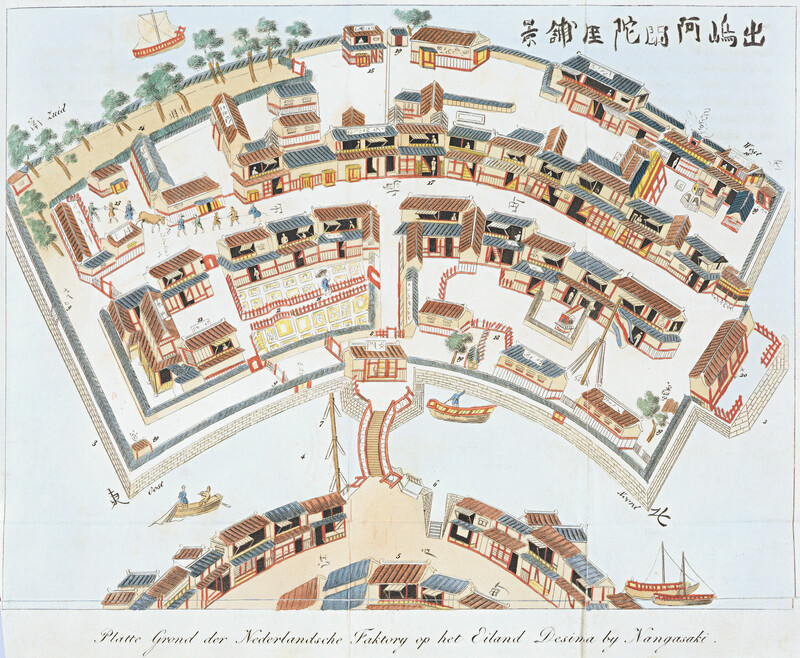 Throughout the period this book takes place (late 18th, early 19th century), Dejima is a Dutch trading post. At this post, the Japanese culture and traders from the Netherlands meet. Cultural go-betweens are translators, medical professionals, clerks, factory workers and managers, diplomats, captains. It is an intersection defined by cultural deference, pretence and miscalculation. The story takes place during Japan’s Edo period. There are very few ‘Occidental’ references to this period of Japan’s history. Most cultural references are Japanese (film, manga, anime, kabuki) with the exception of James Clavell’s Shogun, which Mitchell makes clear to distance himself from as much as possible. It probably would have been sensible if I had spent some time learning about the history of feudal Japan before reading. Japan’s power structure during the Edo period was set up so that 300 Daimyo (territorial lords) held power and were subordinate only to the shogun, who was appointed by the emperor. The closest equivalent to a shogun is a generalissimo. For history buffs, there are many Easter eggs amongst the story that mostly went over my head. The resident monkey, who in one scene runs off with a severed limb, is called William Pitt. Doctor Marinus’ garden is guarded by a scarecrow who goes by Robespierre. There’s also, however, a fiction in the story that overshadows some of the history for its surrealism and horror. Without giving too much away, this revolves around the fictitious Mount Shiranui Shrine – a Shinto complex housing both monks and nuns. This was the part I wasn’t so sure about. This section introduces a lot of writing craft, but sends the story veering off into unreality. And I’m afraid to say, it’s slightly offensive. This reviewer makes a few good points (with spoilers). I enjoyed this, but it was a difficult read. Picking up on something Neil said, “It starts off in a way that’s familiar to anyone who’s read historical fiction before; foreigner in a strange land, culture battles and all that. Foreigner meets and is intrigued by “forbidden” female, caught halfway between a society he doesn’t understand and one he understands but seems to have stranded him,” but it proves to be quite a different story. It’s slightly difficult because of its departures from expectation, but then also difficult because it’s full of dreamlike visions, shifting perspective, interrupted narrative, drug-induced scenes, and departures that confuse our grasp of what genre this files under (historical fiction or surrealism? Blurring the two is bound to disorient). If you’re wondering how Mitchell does it, how he manages to take up such wildly different subject matter, tradition, genres, literary devices… well, mostly it’s because he’s a genius. In this case, it’s also because of his exposure to Japanese and Dutch culture. His wife is originally from Japan, so he was very motivated during his youth to learn Japanese. He also lived in Holland for about a year, so happens to know quite a bit about the Dutch language. This entry was posted in History and tagged David Mitchell, Edo Period, historical fiction, Japan, Shogun. Bookmark the permalink.